Implant supported dentures are dentures that are supported by the placement of fixed implants, rather than being supported by the gums alone. They are strong and reliable and are great for those of you who cannot tolerate the feeling of having the denture completely covering the top of your mouth. When we lose all our teeth, there is nothing to support these dentures, causing them move around more or slip while talking and eating. Placing implants that anchor and support your dentures, you will be able to eat better, speak more clearly and more importantly, smile with confidence. We offer both a fixed and removable solution with our dental implants here at FirstBite Dental, and these can be discussed in further detail at our initial consultation. These are dentures that are supported by or attached to dental implants. A regular denture rests on the gums and tends to fit less firmly. An implant-supported denture has special attachments that snap onto attachments on the implants providing better retention and can be done in either the top of bottom jaw. jaw, a minimum of 4 implants are required to be placed. On the lower jaw, as little as 2 implants can be placed to see a noticeable difference in fit and function. As an added retentive feature, milled bars can be created to join these implants together for better support, fit, and function. 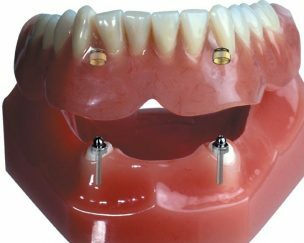 What is the cost of removable implant supported dentures? As a general guide to costs, the placement of 4 implants with a milled bar and a new denture costs around $15,000. Dental Implants are not a one size fits all solution. Every procedure that we do is unique to the patient and is based from careful planning and individual assessments prior to undertaking the procedures. Individual goals and treatment planning must be discussed together. Because each treatment is unique and based on your own situation, a proper detailed quote will be provided to you at the final consultation, once all information is looked at. The starting point is a 3D Xray and consultation which costs $280. These are also sometimes called All on 4, All on 4 Plus or All on 6. This treatment involves placement of a full set of teeth that are fixed on to 4 or 6 implants. This procedure is life changing, as it improves speech and recreates facial balance and aesthetics. It is designed to replace all teeth and can be used to replace existing dentures. It is ideal for people who have had removable dentures for a long period of time. A fixed implant supported denture treatment solution not only replaces missing teeth but also can help restore the lost soft tissue contour. People with a history of gum disease will often need extra lip and facial support. 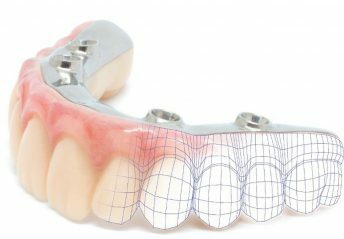 What are the costs involved for a fixed implant supported denture?? Costs will depend on each individual circumstance, and a range of factors need to be considered prior to planning your treatment. An initial consultation is needed and a 3D Xray taken to look at the bone quality. The cost of this appointment is $280. 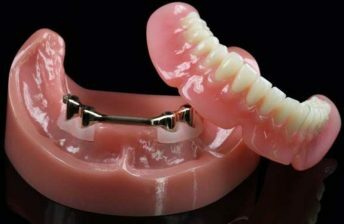 If you currently wear dentures, then the cost to place 4 to 6 implants fixed to a titanium hybrid denture bridge can cost between $19,000 to $23,000 per arch, and costs will depend on the type of milled bar, teeth used, and the particular system and method used. This process can take 3 to 6 months to complete. While the implants are healing, your existing denture will be adjusted and you will continue to wear these during the healing process. What if i currently have teeth that are not in the best shape? If you currently have existing teeth, then more planning and time is required. Your goals need to be discussed and our treatment plan based around this. If an immediate fixed solution is what is required, then teeth are removed, implants placed, and a fixed temporary acrylic bridge is placed for a period of 6 to 12 months while the gums and bone heal. 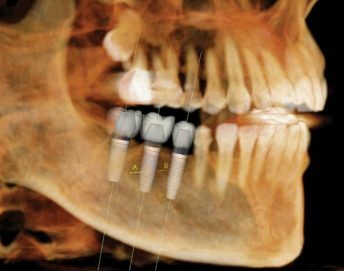 The cost of this procedure is around $15,000 per arch, and these costs can vary depending on how many implants are used, and if there are any additional procedures required such as bone grafting. ts vary from $9000- $12,000. These options will be further discussed with you based on your individual desires, and requirements. Contact us for your Implant Consultation and look forward to enjoying your favourite foods again, with a smile. Visit our Dental Implant case studies. Please review our Dental Implant consent form.